Tennessee Commissioner of Education Candice McQueen speaks about updates on the state department of education's priorities going into a year with a governor's race during an editorial board meeting at the Chattanooga Times Free Press on Tuesday, Jan. 23, 2018, in Chattanooga, Tenn. Updated at 8:49 p.m. on Thursday, Nov. 15, 2018, with more information. The question of whether Tennessee's Gov.-elect Bill Lee will appoint his own education commissioner was answered Thursday with the announcement that current commissioner Candice McQueen will leave her post in January. Gov. Bill Haslam said McQueen, who began the job in January 2015 and makes just over $200,000 annually, will become the CEO of the nonprofit National Institute for Excellence in Teaching's new base in Nashville upon her departure from the state Department of Education. On Thursday, Haslam praised her work over the years. "Candice has worked relentlessly since Day One for Tennessee's students and teachers, and under her leadership, Tennessee earned its first 'A' rating for the standards and the rigor of the state's assessment after receiving an 'F' rating a decade ago," Haslam said in a statement. "Candice has raised the bar for both teachers and students across the state. I am grateful for her service and know she will continue to make an impact on education in Tennessee and across the country." In her new role, McQueen will lead the national nonprofit that works with schools, districts, states and universities to support teachers and school leaders and improve their effectiveness, impacting more than 250,000 educators and 2.5 million students. McQueen, in a letter to her colleagues Thursday, said: "While I am excited about this new opportunity, it is hard to leave this team. "Serving as education commissioner has been the honor of a lifetime, and it has been especially significant to help lead Tennessee's schools in partnership with a governor who has been incredibly focused on improving education for all of our students. I am proud to see what our students and educators have accomplished in these last four years and know we have laid a strong foundation for continued success." McQueen wouldn't speculate on who might be the best fit for her replacement. Haslam will appoint an interim commissioner soon, but Gov.-elect Bill Lee eventually will appoint his own commissioner. Lee's transition team confirmed Thursday that candidates are being vetted — more than 700 people have applied for state positions — and it expects to make announcements about potential candidates in the coming weeks. During McQueen's tenure, the state has pushed to be the "fastest-improving state" in the nation when it comes to K-12 education, and some of what the outgoing commissioner called the administration's "legacy work" has happened right here in Hamilton County. Along with introducing Tennessee Succeeds, a new strategic plan for the state's schools, beefing up standards while eliminating Common Core and aligning assessments with national models, school improvement — especially here in Hamilton County — has been a focus of the department's work during McQueen's tenure. In early 2018, Hamilton County Schools and the state established a Partnership Network, cementing it with a five-year agreement, and a plan for the county's worst-performing schools. "When I came to the department in January 2015, there was a sense of urgency within the first three months around the challenges around poor growth in three schools in Hamilton County. We had invested $10-15 million on improving these schools and were not seeing much growth, and in some cases even saw the opposite," McQueen said. "[There] was a sense of urgency for me and the sense of urgency the state promoted earlier on in a variety of ways, I think, has spurred some changes and new decisions that I think has set Hamilton County on an appropriate path forward." Days before McQueen's announcement, the state received strong marks in a national report on school turnaround plans, The Tennessean reports. McQueen was a leader in developing that plan to address the federal Every Student Succeeds Act. "We have set up the school improvement work as one of the highest priorities of the department," McQueen said, pointing to the creation of the state Office of School Improvement. In May, McQueen named Sharon Griffin assistant commissioner over the state's school improvement efforts. Griffin previously served as superintendent of the Achievement School District. Jill Levine, chief of the Opportunity Zone in Hamilton County, has worked closely with McQueen and the state in an effort to improve the district's 9 total priority schools — schools that rank in the bottom 5 percent in the state. "As someone who is leading the school improvement work in our 12 highest needs schools, I have appreciated Dr. McQueen's laser-like focus on providing a significant investment, both in time and resources, into our schools. Her commitment to providing resources to improve the quality of education for our neediest students has been impressive, and we are grateful for her support," Levine said in a statement. During McQueen's tenure, student achievement in Tennessee has also improved in a variety of areas. Tennessee saw a record-high graduation rate at 89.1 percent in 2017 and 2018, as well as record-high ACT scores statewide. In 2018, students earned an average score of 20.2 percent. "I appreciate Dr. McQueen's dedication to preparing children in Tennessee for the future. Her focus on early learning with the Read To Be Ready initiative and emphasis on post-secondary preparedness for graduates have worked hand in hand with our district's focus," said Bryan Johnson, superintendent of Hamilton County Schools, in a statement. But her time in office was not been without its challenges and controversies. Years of testing fiascos with the state's assessment, TNReady, have plagued her since its implementation in 2015. A spate of issues, including an alleged hack — which was later found to be false — severed fiber-optic cables and issues with the TNReady assessment vendor, Questar, led lawmakers to deem 2018 as another failed year for testing. In April, lawmakers moved not to hold educators or schools accountable using TNReady results, though the department has stood behind the validity of this year's scores. Despite a lack of confidence by some lawmakers and educators in the testing process, Haslam and educators have stood by TNReady. 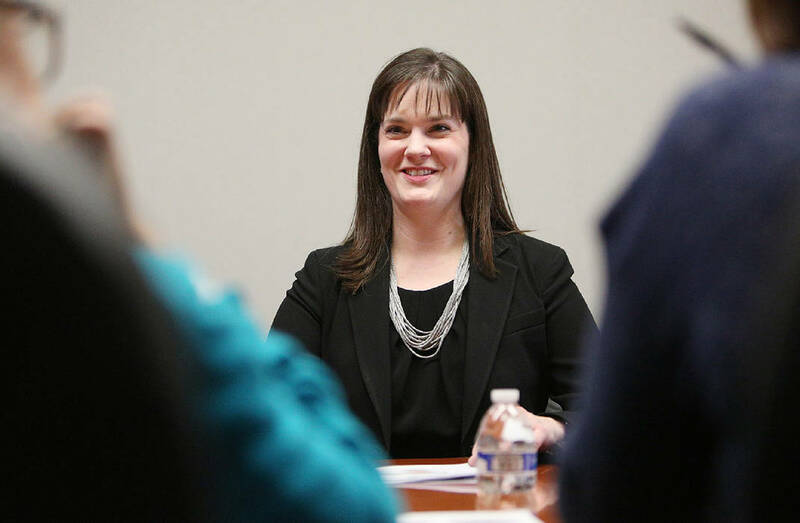 As she nears the end of her time at the helm of Tennessee's education department, McQueen said she's excited to continue her work for the state in a new role. "Through my new role with NIET, I will continue to be an advocate for Tennessee's teachers and work to make sure every child is in a class led by an excellent teacher every day." I am emailing this morning to share with you the news that I am accepting a new role as CEO of the National Institute for Excellence in Teaching (NIET), a national non-profit that is focused on great teaching and learning for every child in America. I will be leaving my role as commissioner in early January, and Gov. Haslam will name an interim commissioner soon. While I am excited about this new opportunity, it is hard to leave this team. Each of you is an incredible and needed leader in this work, whether you are supporting our assessment program, managing federal and state grants, creating new opportunities for students to prepare for college and careers, serving students who are in our most vulnerable populations, developing new tools and materials for educators, overseeing our finances and operations, or leading our school improvement work. You are laser-focused on doing the right thing for Tennessee's students every single day – and I take heart in knowing you will continue this good work in the months and years to come. I look forward to continuing to support your work even as I move into this new role with NIET. I have been blessed to see our students accomplish a number of milestones in the past few years, just a few of which are captured in the announcement from the governor's office below. I have shared some additional highlights that stand out to me in a blog posted today. Please take a look and reflect on what other highlights you would add to this list. I want to hear about those, and I will make sure I have a chance to say goodbye before my final day. You have made the last four years an opportunity of a lifetime, and I am honored to have served our 1 million students alongside you.